The majority of women will experience some thinning by midlife, putting it right up there with menopause, weight gain, dry skin, and wrinkles. However, while people boldly discuss their unhappiness with these other natural age-related occurrences, thinning hair—especially for women—is spoken about in hushed tones. Because I love to discuss previously undiscussed topics (body image, insecurities, what have you), I couldn't pass up the opportunity to shed some light on this particular subject. One of the biggest myths about hair loss, that many people believe to be true, is that there is absolutely nothing you can do about it. "Most people think they have to just accept it and try to hide it, but if you are committed, you can not only stop it but also reverse it," explains Lars Skjoth, hair-loss guru and founder of Harklinikken. The researcher and scientist has personally examined over 60,000 cases of hair loss on three continents, so I figured he was the guy to go to for answers. Read on to find out what he told me. "There certainly are a lot of treatments out there that do not work, and oftentimes that's because they're one-size-fits-all," Skjoth explains. A treatment needs to account for the nuances of the person's particular hair-loss issue. 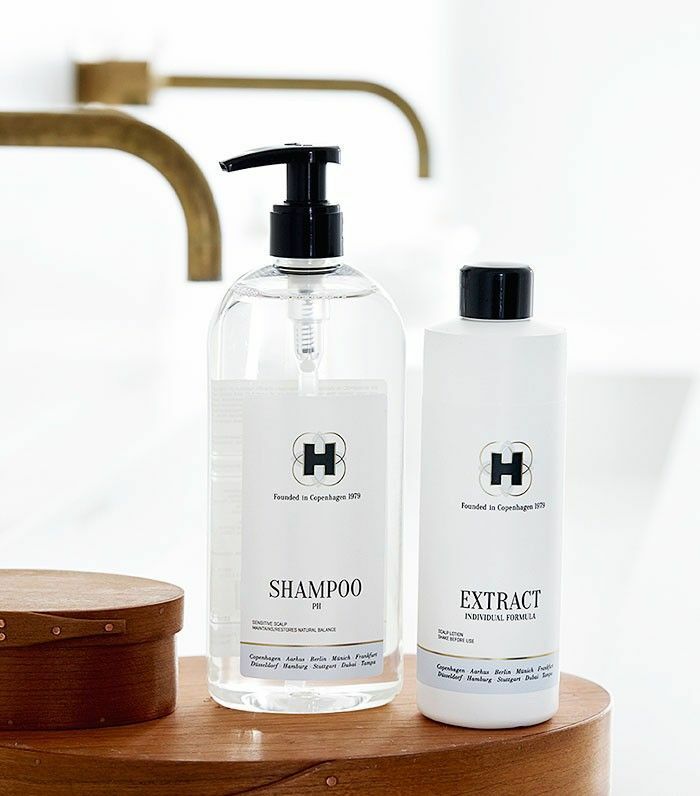 Harklinikken's regimen is completely customized: "We look into each client's genes, gender, age, lifestyle, diet, any health issues, current state of hair loss, and even their location. We weigh all of this when assigning certain products from our regimen, and we produce a custom-made extract just for them, based on these factors." To see real results, you do need to give it time. Skjoth continues, "You aren't going to wake up the next morning with lustrous, long locks. That's why it's important to take note of hair regrowth you can't necessarily see with the naked eye. We use high-tech equipment called Follysis, which photographs and magnifies the scalp to show and count new hairs and active follicles. When clients see the difference in these photographs compared to those we take when they first begin, it's helpful in motivating them remain committed to treatment." As far as hair styling goes, the use of certain styling tools (like flatirons and hot rollers) as well as braiding, hair extensions, and tight ponytails, may cause stress on the hair strands. "Most importantly," Skjoth says, "styles where you have to pull and apply tension can cause permanent loss from traction alopecia, which is hair loss caused by pulling. The constant pulling can cause hairs to be ripped out and, depending on the severity or how often the same follicles are affected, it can cause scars within the hair follicles (meaning the hair will not grow back)." In terms of nutrition, many people talk about how eating certain foods can affect the look and feel of your skin. The same can be said for hair. Skjoth says, "I work with many clients who do not get sufficient nutrients in their diet—eating right is one of the easiest ways to help combat the problem. Where some weight-loss plans ask you to eat nonfat foods, I actually recommend avoiding those foods for the health of your hair. They are devoid of essential nutrients your hair (and the rest of your body) needs in order to remain vibrant and strong." Similarly, just like staying hydrated benefits your skin, it benefits your hair as well. "Drinking water, especially real spring water since it's full of natural minerals, will optimize conditions for your hair," recommends Skjoth. As mentioned above, you may need to re-evaluate your styling habits. "Certain hairstyles can cause extreme damage to your follicles, but styling products can also affect your scalp," explains Skjoth. He adds, "Most chemicals used in styling products are not meant to be exposed to the skin at all, which is difficult to avoid when you apply them to your hair. Certain styling products and dry shampoo build up on the scalp and may cause hair loss, dermatitis, or dull, limp, and lifeless hair. If you're suffering from hair loss or thinning, make sure to avoid the following: artificial color, perfume, diethanolamine, propylparaben, butylparaben, isobutylparaben, methylisothiazolinone, DMDM hydantoin, coumarin, geraniol, octinoxate, amylcinnamaldehyde, paraffin liquidum, and petrolatum." Heat styling can also damage your hair. Heat expands the cuticle layer of the hair and speeds up the loss of moisture from your hair. "If the hair is already porous or is chemically processed, the heat of a hair dryer can result in excessive moisture loss, and hair will look [drier] and lifeless. Excessive heat may also provoke the scalp and the oil glands. Your scalp can become dry and irritated from excessive heat, and oil glands may overproduce to protect the scalp. Both of these phenomena are not optimizing conditions for hair and scalp because they negatively affect your scalp's pH balance, so for our clients, we often suggest reducing use of hair dryer, and when using it, go for medium warm or cold," suggests Skjoth. The best thing you can do for your hair is try to provide optimal conditions for your scalp to ensure its pH levels are balanced. Also, pay attention to the way your scalp feels or looks after using certain products, take stock of the weight and volume of your ponytail, and count the number of times your hair band goes around it; that way, you are aware of changes sooner and can identify and resolve the problem quickly. "If you're already suffering from hair loss, the most important thing is to identify if there may be any extraneous factors contributing to the problem. Sometimes when clients come to us in search of treatment for their hair loss, we are able to identify underlying causes such as, for instance, a thyroid problem. We tell them first to get that other issue sorted out, and then come back to us if they are still experiencing problems," Skjoth says. Lifestyle changes can definitely help. However, if you do come to find that your hair loss cannot be curbed that way, Harklinikken may be the answer. See if you're a candidate and, most of all, know that you are not alone. While we're on the subject of taboo topics, let's talk body image, shall we? This story was originally published on August 24, 2016. We Asked Scalp Experts: Can Home Remedies for Thicker Hair Actually Work?